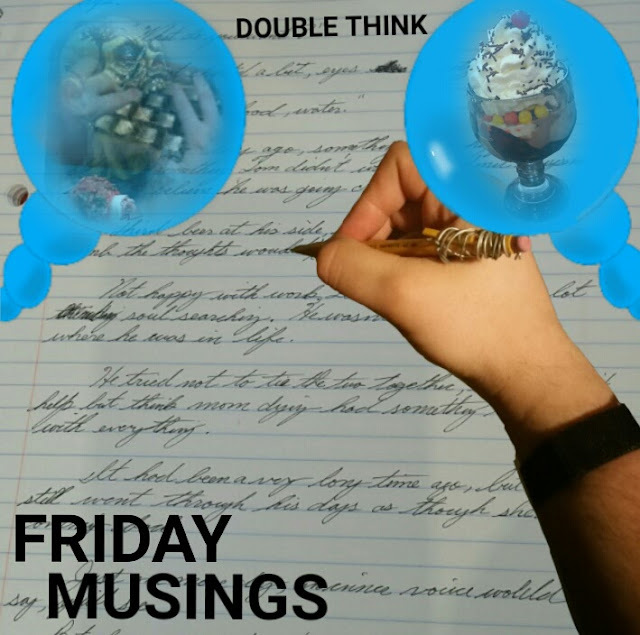 Similar to the story that made double talk famous, double think is what I might title the event writers go through almost all the time throughout the day. As I do mundane things throughout the day, think mundane thoughts, I come upon random memories. Many things pass through my mind. Sometimes I run over events that happened to me during the day, or even the day/week/month before--sometimes even years ago. I find that when I'm thinking about this my imagination runs wild. I think of different scenarios--not necessarily my own--that spawn a full scene. It could be something as innocent as the ice cream I had a month ago at Friendly's, but then other things are added via my imagination and the rest is madness. Or not. I guess this is how stories come about, but although, for the most part, it's welcome, sometimes it's not a smooth experience. Intruding, at times. I have come to realize what is happening, but it's come to the point where these side thoughts happen quite often. Double think, I guess you could say. My mind can take something real in my life then add to it, make multiple scenarios for that snippet of thought, change up characters, sprinkle in drama, or other elements. Sometimes it's cool and gives me great ideas, other times it can be annoying. Not to be confused with the term Double Speak, made famous in the story 1984. The phenomenon I've coined for the title of this post is what I assume happens to all writers. I hope, or else I'm nuts! I can't be the only one, though. It's just very pervasive and can be annoying when it's not something I want to think about at the time when it comes. Do you have these thoughts?